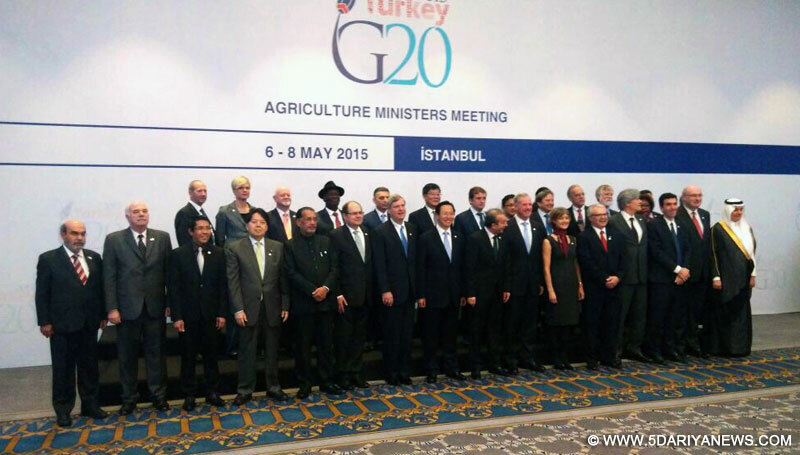 The Union Minister for Agriculture, Radha Mohan Singh with other members at G-20 Agriculture Ministers Meet, at Istanbul on May 08, 2015. Union Agriculture Minister, Radha Mohan Singh today addressed the G-20 Agriculture Ministers Meeting at Istanbul, Turkey. Addressing the meet Shri Singh said that there is need to direct itself more towards the accountability and monitoring of the ongoing initiatives rather adding more. Minister emphasized the need of research in agriculture sector to enhance the production and productivity which also address to contain the price volatility. Minister also focused on the various issues like food security, price volatility, reducing food waste and losses. Shri Singh apprised of the initiatives of the Government for the benefit of the farmers.